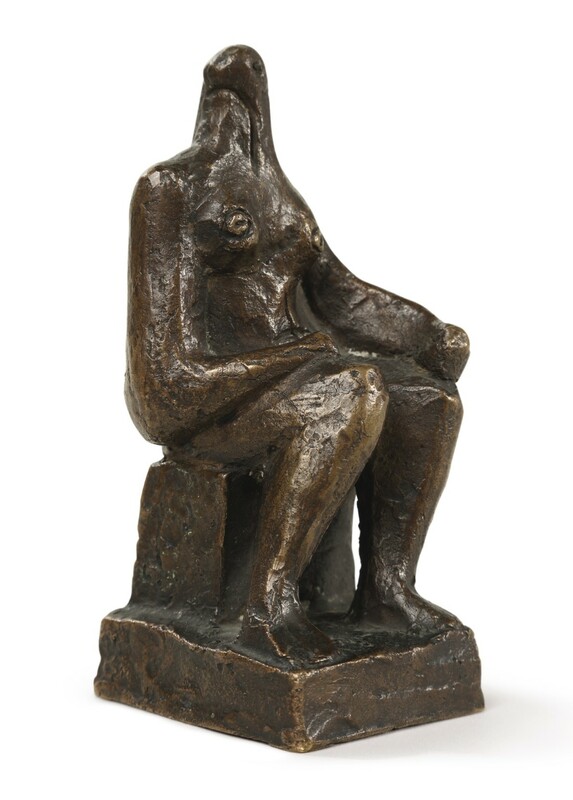 Henry Moore’s ‘Small Seated Figure’ was conceived in 1936 during one of the most significant periods of the sculptor’s career. At this time before the outbreak of the Second World War, Moore’s sculptures took on a darker complexity that united two dominating movements of the 20th century: Abstraction and Surrealism. Moore became closely associated with the Surrealists during regular trips to Paris in the 1930s, notably visiting the studios of Alberto Giacometti and André Breton. As a founding member of the British group ‘Unit One’ beside Paul Nash, Ben Nicholson and Barbara Hepworth, Moore also played a pivotal role in the International Surrealist Exhibition in London in 1936: the same year in which the present sculpture was created. Moore embraced the intuitive Surrealist method, allowing his human figure to be formed by the subconscious and libidinal urges. During the 1930s Moore also became to experiment with a lyrical form of abstraction inspired by naturally occurring organic forms such as pebbles and bones. In the present sculpture, Moore reduces the figure to a fluid, biomorphic form characteristic of the new international abstract movement of which he had become a paradigmatic representative. The soft, curvilinear body of ‘Small Seated Figure’ refers to the crucial influence of Jean Arp, whose ‘Concretions’ from the 1930s embodied the fluid process of life and growth. Robert Melville described Moore’s work in this organic formal language as akin to Arp “but more persistently penetrated by human associations”. Through this playful movement towards abstraction, Moore sought to capture a human psychological content with greater directness and intensity. During this pivotal period of the 1930s Moore was included in the British Pavilion for the Venice Biennale (1930) and the first monograph on his work was published by Herbert Read (1934). Examples of 'Small Seated Figure' can now be found at the Art Gallery of Ontario and Yale Centre for British Art, New Haven. This particular cast was acquired by celebrated art collector Joseph Herman Hirshhorn and gifted to the Hirshhorn Museum in Washington from his estate in 1987. Joseph Herman Hirshhorn, Washington, D.C.